Bwindi Impenetrable Forest National Park famous lies in southwestern Uganda, along the mighty western rift valley. It straddles between the district of Kabale, Rukungiri, Kisoro and others. This park is famous for mountain gorilla tours in Uganda and covers an area of 331 square kilometers. It stands at elevation of about 1160 meters at Ishasha gorge to 2607 meters around the Rwamunyonyi peak. The park experiences an average temperature range of 7 to 20 degrees Celsius per year and its coldest months fall between June and July and the highest amount of rainfall is experienced from March to April and from September to November. Bwindi Impenetrable Forest features among the very few tropical rain forest on earth that inhabit most the rare mountain gorillas and for visitors on Uganda safari, this is one of the perfect spots for you to realize your dreams in Africa. A trek to see a group of these unique species is referred as a magical encounter of lifetime. The park also offers refuge to over 90 species of mammals 11 of which are primates that include the black and white colobus monkeys, L’Hoests monkeys, grey checked mangabeys, blue monkeys, chimpanzees and others. Visitors can also spot forest elephants, antelopes, forest hogs, over 163 different tree species, 202 butterflies, 27 species of frogs, 350 bird species including the rare African green broadbill, the cream banded swallowtail; reptiles (chameleons and geckos) and many more. This UNESCO World Heritage Site features also about 23 highly localized Albertine Rift endemics. Like most protected areas in Uganda, Bwindi Impenetrable Forest National Park is equally under the management of Uganda Wildlife Authority (UWA). A visit to Munyanga River trails rewards visitors with amazing attractions. There are several tree ferns, orchids and epithetic ferns. The trail takes visitors up to the 3 (three) crystal clear falls of the Ruizi River trail, Rushura River trail and Muzabajiro trail. Bwindi Impenetrable Forest National Park was gazetted in 1942 but later upgraded as a national park in 1992. It was established mainly to offer refuge to the rare mountain gorillas which makes the park one of the most sought after protected areas for mountain gorilla trekking. The park boasts of over 400 individuals of mountain gorillas and about 14 habituated groups are available for visitors to realize their dreams. The habituated families are distributed within the four (4) main trailheads where this lifetime adventure starts every day at the park. They include Buhoma, Ruhija, Rushaga and Nkuringo area. This is the main highlight in Bwindi Impenetrable Forest National Park. There are 12 groups that have been set for this and they are tracked within the four main areas of Buhoma, Nkuringo, Rushaga and Ruhija. The dry season (June to August, December to February) is the best time for one to realize his or her dreams with these rare primates while they are in their natural habitat. This doesn’t mean that there is no gorilla trekking during the wet season. 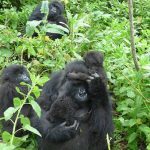 It is also possible for you to track mountain gorillas in Uganda during the rainy season that you will have some challenges when it comes to hiking through the thick forest and slippery steep slopes. The wet season which also features as the low season in Uganda falls in the months of April to May. The permits in Uganda are sold at $600 per person. Bwindi Impenetrable Forest National Park offers refuge to over 350 bird species that rank the park as one of the Important Bird Areas in Uganda. If you are a bird lover and you are on Uganda safari to this protected area, you will spot out species like the African broadbill, yellow eyed black fly catcher, bar tailed trogon, dusky crimson, rusty faced woodland, Gruel’s rush warbler, Kivu ground thrush and many others. Bwindi Impenetrable Forest National Park is also perfect for visitors to explore it while walking. There are 4 hiking trails that are popularly hiked through by travelers on Uganda safari. While you are on nature walk, you will be in position to sight at the birds, primates, butterflies, trees and many more species that make this park an incredible destination for one to spend a vacation. The River Munyanga walk features as the most popular and short walk to the 3 stunning crystal clear waterfalls which also comes with remarkable tree species like ferns, epithetic, orchids and others. There is also Rushura walk that allows you to catch the views of the mighty western rift valley floor and to the west, the Congo Virunga National Park, Lake Edward and the Rwenzori Mountain ranges. The Muzabajiro walk offers incredible views of the Bwindi Impenetrable Forest, the western rift valley and Virungas. The ivy river walk, this is mainly recognized for its amazing birding experiences. 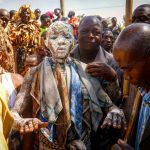 The Buhoma village walk on the hand provides visitors spectacular views of the rural set up of the surrounding homesteads at the park, visiting the local traditional healer, banana beer making demonstration area, unforgettable cultural experiences in the evening. Lastly the bamboo trail walk takes visitors to one of the highly diverse sites that features 14 vegetation zones and comes with incredible views of Lake Bunyonyi and Mafuga forest. Bwindi Impenetrable Forest National Park can be reached through various routes which all link up to Butogota. From Kabale, you will drive for 108 kilometers to Buhoma through Ruhija and this lasts for 3 hours and you will need a 4 wheel drive car for this journey. From Kampala to Buhoma which features as the perfect route for road users to Kabale and from Mbarara to Ntungamo. From Ntungamo then on you will turn to the right about 45 kilometers to Rukungiri, through Kambuga to Kanungu and you enter to Butogota 17 kilometers to Buhoma area. The other route is from Kampala to Kasese which comes with 2 routes first through Katunguru, Ishasha and Kihihi about 3 to 5 hours drive. The notable accommodation facilities for visitor stay at Bwindi Impenetrable Forest National Park include the Mantana Luxury Tented Camp, Lake Kitandara Bwindi Camp, Gorilla Forest Camp, Volcano Bwindi Camp and others. With the discussion above, Bwindi Impenetrable Forest National Park is one of most sought after destinations for mountain gorilla adventures in Uganda. However, there are other significant wildlife species that are worth exploring by visitors on Uganda safari.